I've noticed that nobody has posted it yet... so here they are! Well, Prince William said that she looks after Kate, must be a beautiful baby then! As with any couple, I'm sure Kate and Will are both adjusting to being new parents. Same goes to Prince Charles on being a new grandpa! Prince George Alexander Louis is certainly the most famous baby!! Very famous indeed! There are lots of people doing the "royal baby watch" thing. Yeah, I'm sure they have the same form of adjustment as with the other new parents. But wait, being a royal couple has a far greater advantage, right! Welcome to the world Prince George! I love Kate and Will and I equally love Prince George!! Well, I am quite sure that they will not be worrying about lack of funds to buy a new crib and stroller, or lack of help! 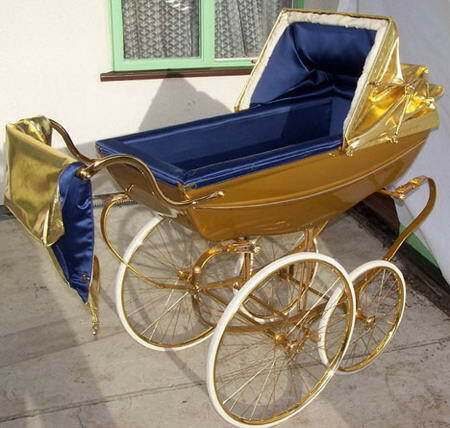 I bet the stroller is something like this! Super COOL!! !